Now that Christmas is over I can officially begin the string of "This is what I made for people!" posts, right? Everyone else is doing it, so here's number one for me! This is really my first year of having any sort of skill whatsoever as a sewist, since I only bought my first machine last November on Black Friday (yes, I've already upgraded!). I'm terrible at gift-giving, and I'll be the first to admit it (see? I just did!) so one day I announced to my coworkers, "Y'all are getting placemats. What colors do you want?" Flying geese blocks, with bright happy stripes. They accidentally ended up going in two different directions, so this is who they ended up. They're a set of four - one with the blue stripes and dots, one with the blue stripes and asterisks, and one with purple stripes/dots and one with purple stripes/asterisks. Backed in black, quilted in the ditch and zig-zag machine bound with contrasting white thread. Gray binding left over from finishing our quilt. 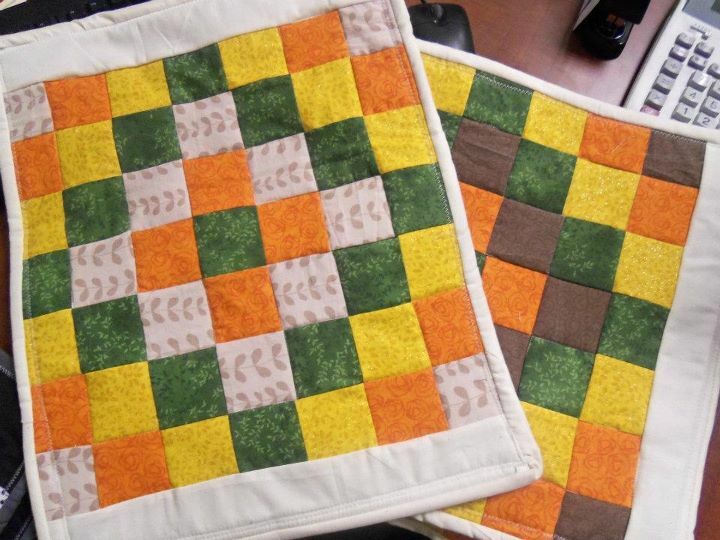 I think to have followed the design "properly" the center block should have been yellow, but I picked green instead. Oops? Anyway, the brown prints were all different on each of the four. I was pretty proud that the directional print on the top one ended up all going in the same direction! 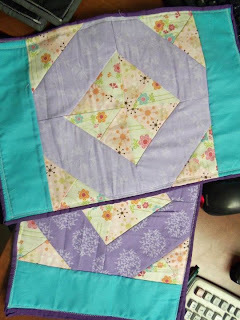 They were quilted with white, just around some of the squares. The backing fabric was something I had picked up at Joann's and realized I was never going to use - the placemats' recipient liked it, though, because she decided it was kind of Hawaiian, and her family owned a condo there for quite a while. Hooray! These were called some kind of signature block that I found online someplace. The purples are all different on the four of them. The way I put the blocks together formed a pinwheel in the middle of them, which was unplanned but turned out pretty cool! They were backed with something else that was equally floral/pastelly. 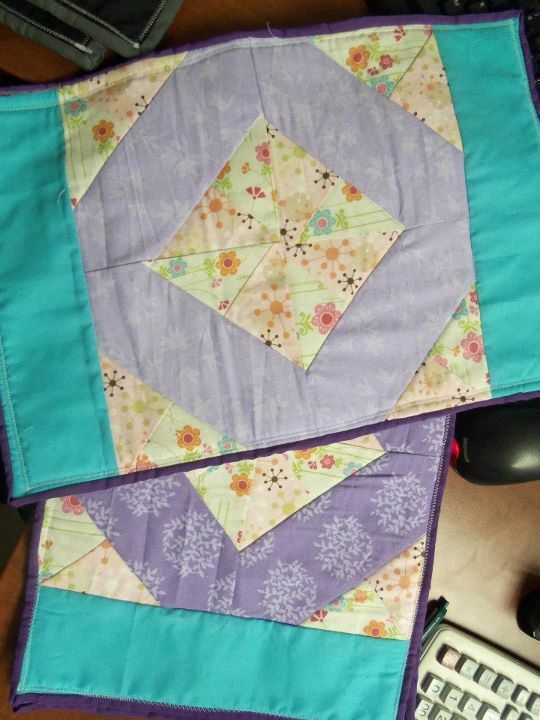 I quilted them around the inside and outside of the "O" in the middle, so the "O" is reflected on the back, too! The day I was finally able to finish them, it took me NINE HOURS to get them done. I think I put probably 20 hours in, total for the 12 placemats. 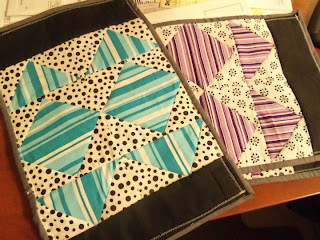 Next year, I'm thinking small zippered pouches! Small things are the best! They are lovely gifts! The forest ones are gorgeous :) I think zip pouches would be much quicker! !